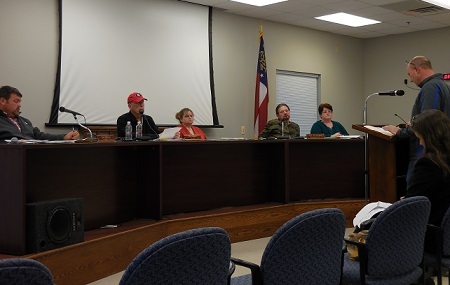 BLUE RIDGE, Ga. – The Fannin County Board of Commissioners (BOC) received updates from several departments at the second monthly meeting held on Jan. 23. Board of Commissioners receive updates from several county departments. The first to speak to the board was Public Works Director Zack Ratcliff. Ratcliff spoke of the recent severe weather experienced throughout the county and the impact on the county’s resources reserved for such scenarios. “With temperatures being in the low teens, it made it pretty difficult to clear the roads,” Ratcliff spoke of the recent snow storm that closed county offices and Fannin County schools for several days. Due to the recent freezing weather, Ratcliff reported that his department had used 300 tons of salt and 150 tons of the 89 gravel that the county had set aside, and that supplies of these would need to be replenished. Ratcliff also reported that two vehicles in the Public Works department, a chipper and a Ford flatbed, were in need of repairs and would possibly have to be replaced in the near future. “Our sign department made and replaced over 400 signs, street signs, this year.” Ratcliff updated. Post 2 Commissioner Larry Joe Sosebee questioned the cost of replacing signs, and Ratcliff replied that it varied but the approximate cost was around $35.00 per sign. Ratcliff also stated the department was increasing the height of many signs posted and this action had reduced the number of signs being stolen. Board of Commissioners Chairman Stan Helton addressed Ratcliff, “Just to reiterate what you’ve done here, if you go back a year ago, personnel wise and wages, you cut that in excess of 25 percent, and you’ve done it the right way. Parks and Recreation Director Eddie O’Neal talks about Christmas Clash basketball tournament. 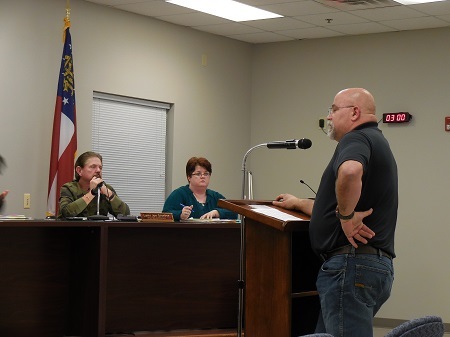 Eddie O’Neal, director of Fannin County Parks and Recreation, was second to update the BOC. O’Neal reported that 1,600 visitors had signed in and made use of the recreation facilities in the month of December. “We also hosted our third annual Christmas Clash basketball tournament where we had 52 teams compete,” O’Neal spoke of the growth of this event. Teams came from several counties within Georgia for this four-day event. O’Neal informed the board that the success of this event had generated nearly $15,000 in revenue. O’Neal also spoke of the Summer Day Camp program, which continues to grow, and of additional services that might be offered this year. Parents who utilize the program have inquired of a later pick-up time. Currently, children in the program would need to be picked up by 3 p.m. O’Neal suggested an extra charge to cover costs of keeping the facility open later so parents could pick up at 4 or 5 p.m. The cost for two weeks of the Summer Day Camp program is $30.00, and an extra charge of $20.00 is being proposed for parents who wish to have a later pick up. Post 1 Commissioner Earl Johnson was pleased with the transparency of revenues and purchases that is now being shown in frequent reports from the Parks and Recreation department, and Stan Helton added that he had received numerous calls from citizens that expressed their enthusiasm for the programs that the department has been adding. “We’ve been approached by Faith Presbyterian Church. Those guys have always done what’s called a Seamless Summer food program,” O’Neal added to his update. The Seamless Summer program provides food for children in need over the summer. Union County High School would prep meals for this program in the past, but will not be able to in 2018 due to renovations taking place over the summer break. The department of Parks and Recreation has been approached to see if they could prep these meals while prepping their own meals for the Summer Day Camp program. “We would like to help these guys out,” O’Neal went on. The program feeds a little over 200 kids during the summer and is funded via reimbursement from Bright from the Start, a Georgia state Department of Early Care and Learning. No decision was made by the BOC regarding this proposal. Chief Land Development Officer Marie Woody notified the BOC that the Scrap Tire Removal Program has been a success and that the future dates scheduled for tire drop off have been cancelled. Board of Assessors member Troy Junnier speaks on behalf of the tax assessors in hopes of getting new vehicles. Board of Assessors board member Troy Junnier spoke on behalf of the Tax Assessors Office asking for two replacement vehicles for the department. Discussions became heated as Post 1 Commissioner Earl Johnson expressed that the department does not need new vehicles and should look into buying used. Ultimately the board agreed to consider purchasing two used vehicles for the department with a spending limit of $20,000 per vehicle. BLUE RIDGE, Ga. – Fannin County Sheriff’s Office could receive a new vehicle after Chief Deputy Major Keith Bosen was involved in an accident on state Route 5. Sheriff Dane Kirby was present to discuss the renewal of contracts for the Fannin County Jail. The vehicle suffered damage to the back end and also sustained damage to the frame. Kirby and Bosen had searched for a used vehicle after finding out about the extent of the damage, but we’re unable to locate one. A new vehicle, which was found at Jacky Jones Ford in Cleveland, Georgia, has a price tag of $26,700. Kirby explained that he still had funds in his current budget to purchase this vehicle but had not allocated funds in 2018 for such a purchase. Kirby stated that an insurance settlement from the wrecked vehicle would be used to partially reimburse the expenditure of securing the new vehicle. Kirby and Bosen had discussed this possibility previously, and Bosen had expressed reluctance in continued use of the vehicle. “I’m not so sure I would want it for an emergency vehicle after all that damage has been done to it,” Kirby explained. After some discussion, the BOC voted unanimously to allow the purchase of the new vehicle for Fannin County Sheriff’s Department. The purchase of the new vehicle was a main focus, but Sheriff Dane Kirby was also present to have the BOC renew two contracts. 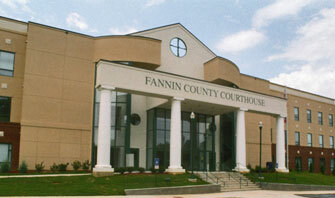 These annual contracts concern food and health services provided to Fannin County Jail. The cost of the food service contract showed a 1 percent increase, and the contract concerning healthcare increased by 3 percent. The BOC collectively agreed that the increase in cost of these two contracts was not unreasonable and unanimously voted to re-enter into both of the agreements. Deputy Director of Fannin County Emergency Management Agency (EMA) Patrick Cooke was also on the agenda to discuss the purchase of a radio tower for the new 911 facility. The county’s new 911 facility will be located at 930 Windy Ridge Road, and construction is already underway. 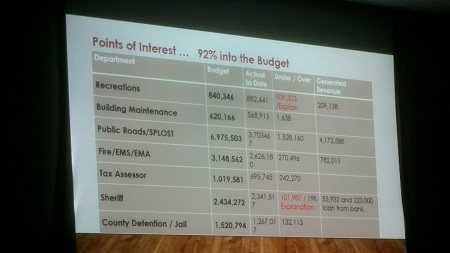 Gazaway presented the monthly budget update, and showed were departments stood as of Nov. 30. Cooke explained that the purchase amount would be covered in the 2017 budget. A tower located on Bullen Gap Road had been damaged, and the majority of the cost of the new tower will come from an insurance reimbursement that the department had received. The insurance settlement for $18,898.23 would offset the cost of the new tower to where only $3,101.77 would need to be pulled from the budget. The new tower would be able to communicate with the main repeater located on Brawley Mountain and would also act as a back up in the event that the main repeater went down. The BOC voted unanimously for the purchase of the new radio tower, and construction of the new 911 facility is expected to move forward on schedule. Fannin County Finance Director Robin Gazaway presented a monthly update of the county’s current budget prior to the BOC discussing and passing the county’s 2018 budget. Through Nov. 30, the county is showing that it is under budget by approximately $500,000. Gazaway explained that as of the Nov. 30 date, the county was currently 92 percent into the budget for 2017. 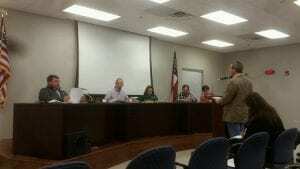 Sosebee questioned specifically about the Tax Assessors budget, and Gazaway replied that they were $242,270 under budget for the year. With information presented by Gazaway concerning the county’s spending and revenue, the BOC passed the 2018 Budget at the end of the meeting. BLUE RIDGE, Ga. – The Fannin County Emergency Management Agency (EMA) moved forward with the purchase of technology to improve services and efficiency when it comes to public safety. Fannin County Deputy Director of EMA/E-911 Patrick Cooke addressed the Board of Commissioners (BOC) at the Jan. 23 meeting explaining the need for new technology that would allow the option of Global Positioning System (GPS) location on calls coming to the 911 center from cell phone users. EMA/E-911 Depurt Director Patrick Cooke gives board members bids received for new equipment for the department. This new feature will be an add-on to the current 911 computer-aided dispatch (CAD) system and would come with a price tag of $5,258. There would be a annual maintenance fee in the future. The price of maintenance for the second year would be $4,725. Fannin County BOC Chairman Stan Helton asked Cooke for examples from the past where this kind of technology would have been beneficial. Cooke immediately cited that there are numerous calls from hikers who have become lost in the woods and stated that GPS location would save time in these instances. Cooke recalled a specific incident of a hiker last year who was suffering from a stroke while hiking the Benton MacKaye Trail. Cooke felt that had this technology been in use during the time of this call, it could have saved approximately two hours in locating the individual. The new GPS location feature works by the caller responding to a text message sent to their phone from the 911 center. Once the caller accepts the link provided in the text, dispatchers are able to use GPS location from the cell phone to pinpoint the caller’s location. Once the purchase transaction is complete, the new GPS location program will take about a month to implement. Cooke also presented the BOC with bids for new equipment for a mobile command unit. The Fannin County EMA had been awarded a Homeland Security Grant in 2017, and the purchase of the mobile command equipment would be reimbursed through this grant. Fannin County EMA Director Robert Graham confirmed previously with the board that when applying for the grant, a list of equipment had been given and the grant would fully fund the list. Cooke presented the board with three quotes. The highest bid came in at $27,602 and the lowest bid received was $20,526. Post 2 Commissioner Larry Joe Sosebee questioned the qualifications of the company with the lowest bid, and Cooke replied the EMA had worked with the company before and had been satisfied with the results. Helton motioned for the purchase of the new equipment for the EMA, Sosebee seconded the motion, and the board approved unanimously to award the project to the lowest bidder, Mountain Communications, Inc.
BLUE RIDGE, Ga. – Members of Fannin County Emergency Management Agency (EMA), Emergency Medical Services (EMS) and Fire Department gathered at Willow Creek Falls Thursday evening, Dec. 15, for the departments’ annual Christmas Dinner and Awards Banquet. Following a festive holiday dinner complete with turkey, ham and all the trimmings enjoyed by a large number of firefighters and emergency personnel along with their families, Fannin County EMA Director Robert Graham and Fire and Rescue Chief Larry Thomas presented the yearly awards to honor personnel as nominated by their peers. “I want to say thank you to everyone whose made this department something really special,” Graham said just before presenting the awards. Spencer Kitchens was announced by Graham as the Emergency Medical Technician (EMT) of the Year. Graham spoke highly of Kitchens and Kitchens’ constant willingness to improvise in difficult situations. Kitchens was not able to attend the banquet Thursday. 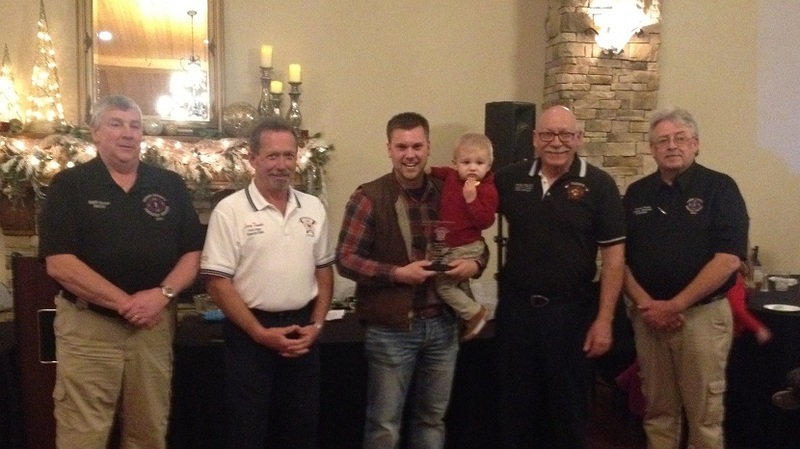 Next, Graham presented the award of David W. Curtis Memorial Paramedic of the Year to Bobby Long. 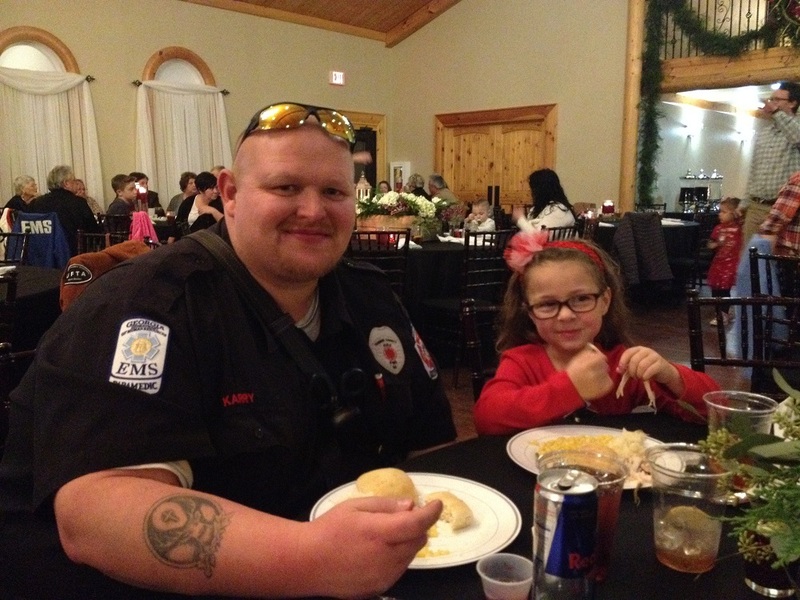 “(Long) is a big asset to anyone going through paramedic school as he is a wealth of knowledge, which he is always eager to share,” Graham said of Long. Paramedic Bobby Long, center, receives the award for Paramedic of the Year. Seen here with Long are, from left, EMA Deputy Director Darrell Payne, Fire and Rescue Deputy Chief Rob Ross, Long, EMA Director Robert Graham and Fire and Rescue Chief Larry Thomas. 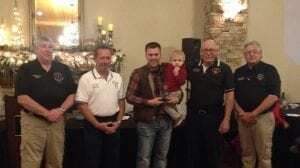 Chief Thomas presented the FCFD Rookie of the Year award to Tim Grant. “He does a lot. He does a lot that is unseen out there, too,” Thomas stated of Grant, adding he suspected the award might come as a surprise to Grant. Tim Grant, center, receives the Rookie of the Year award. Seen here with Grant are from left, EMA Director Robert Graham, Fire and Rescue Chief Larry Thomas, Grant holding son Lawson Timothy Grant, Fire and Rescue Deputy Chief Rob Ross and EMA Deputy Director Darrell Payne. 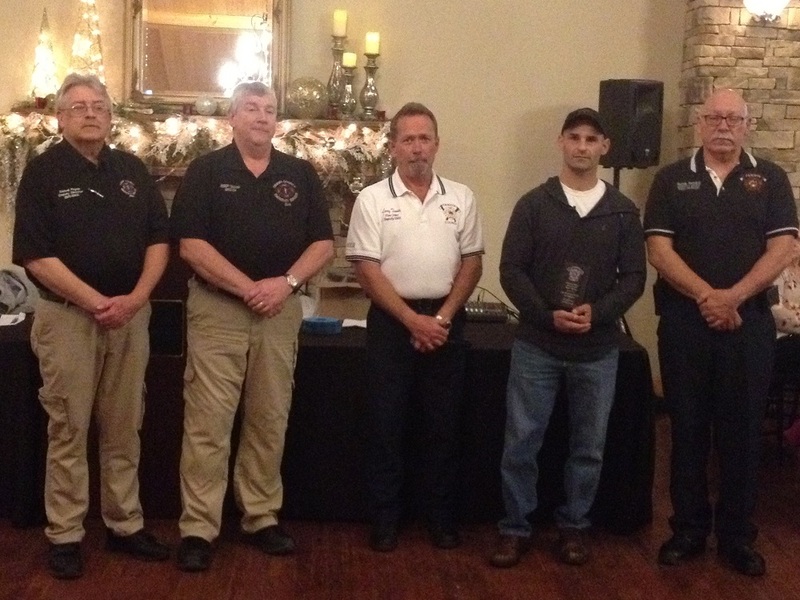 Firefighter Channing Johnstone, center, receives the Firefighter of the Year award. Seen here with Johnstone are, from left, EMA Director Robert Graham, Fire and Rescue Chief Larry Thomas, Johnstone, EMA Deputy Director Darrell Payne and Fire and Rescue Deputy Chief Rob Ross. For Volunteer of the Year, Chief Thomas had the privilege of presenting his son, Josh Thomas, with the award and jokingly reminded everyone that the award nominations came directly from the personnel and not the officers. 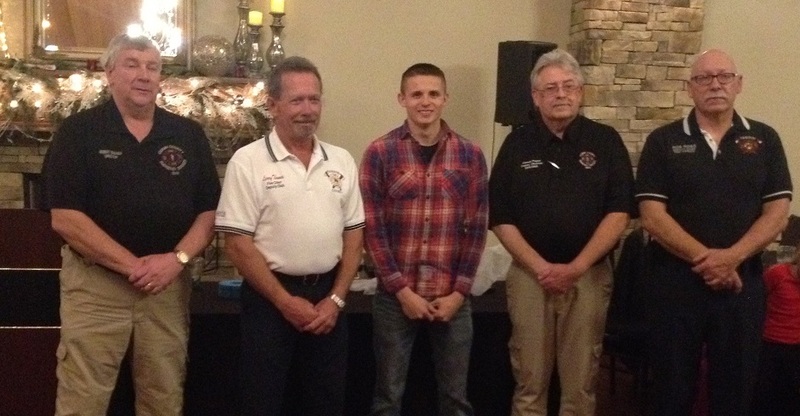 Firefighter Josh Thomas, center, receives the Volunteer of the Year award. Seen here with Josh Thomas are, from left, EMA Deputy Director Darrell Payne, EMA Director Robert Graham, Josh Thomas, Fire and Rescue Chief Larry Thomas and Fire and Rescue Deputy Chief Rob Ross. Next, Chief Thomas presented Ryan McDaris with the Officer of the Year award. “I stand proud to call him one of my lead officers,” Thomas said as he presented McDaris with the honor. 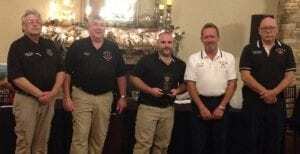 Ryan McDaris, center, receives the Officer of the Year. Seen here with McDaris are, from left, EMA Deputy Director Darrell Payne, EMA Director Robert Graham, McDaris, Fire and Rescue Deputy Chief Rob Ross and Chief Larry Thomas. The Lawrence Waters Rescue Award went to Jason Turner by Chief Thomas for his unwavering commitment to duty and leadership. Jason Turner, second from right, receives the Lawrence Waters Rescue Award. Seen here with Turner are, from left, EMA Deputy Director Darrell Payne, EMA Director Robert Graham, Fire and Rescue Chief Larry Thomas, Turner and Fire and Rescue Deputy Chief Rob Ross. 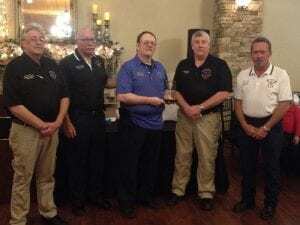 Darrin Conner, who also was not present to receive the award, was honored with the Communications Officer of the Year award. A framed memorial to Howard R. (Ted) Gregory will hang at Station 14. An emotional moment came at the end of the evening when Thomas unveiled a large framed collage of photos honoring the memory of the late Fannin County Fire Department Captain, Howard R. (Ted) Gregory. Gregory, Thomas explained, joined FCFD in 2000 and served as captain of Station 10 starting in 2004 and later at Station 14 beginning in 2007. Gregory passed away in 2012 after suffering a heart attack, and Thomas stated he has wanted to do something for the past five years to honor Gregory’s memory. 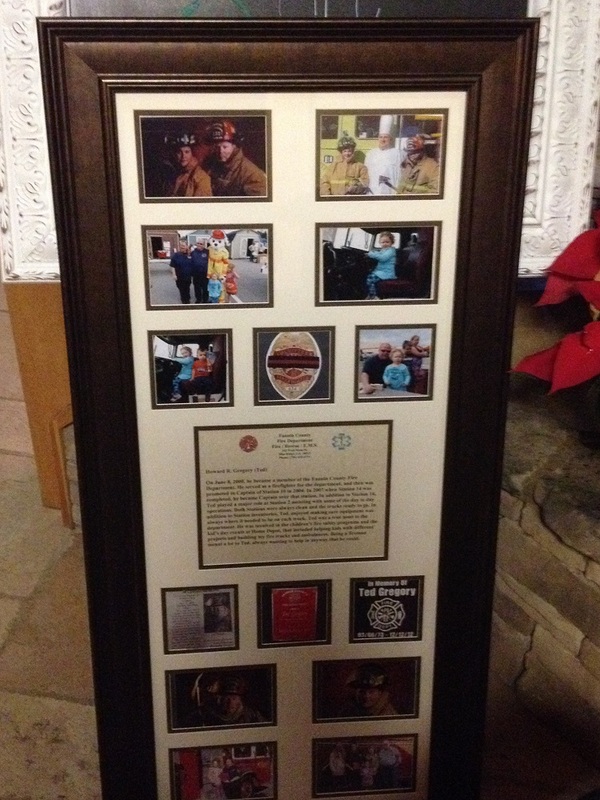 The collage features photos of Gregory during his time spent with FCFD along with his badge and a heartfelt tribute written to commemorate Gregory’s service. “I wanted everyone to know how much Ted Gregory meant to me,” Thomas said, choking back tears. 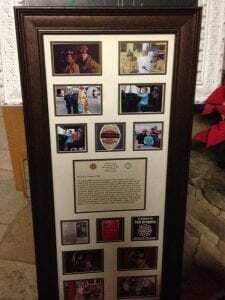 The framed tribute to Gregory will hang at Station 14 where the captain served.